Trucks are covering 300-325 km a day on an average against about 225 km a day before GST, according to a document prepared by the road transport ministry. 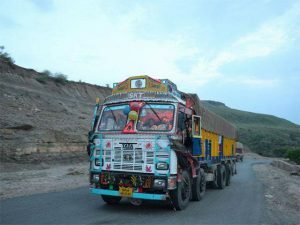 The distance travelled by trucks per day has increased by at least 30% post the rollout of goods and services tax (GST), according to a document prepared by the road transport ministry on the impact of GST on logistics sector. Trucks are covering 300-325 km a day on an average against about 225 km a day before GST, it said. The booklet, which is being shared with MPs and also in the social media, mentions that the end of border checkposts across states, reduction in congestion on highways and logistics firms avoiding wasteful expenditure on tax compliance and deposit of inter-state sales tax would reduce the logistics cost by 10-12%. At present, the logistics cost is about 14% of the total value of goods as against 6-8% in developed countries. The ministry, in its booklet, mentions that typically a truck spends 20% of its run time at inter-state checkposts and covers about 60,000 km annually as against two lakh km in the West. Citing the example of Chennai-Kolkata route, the report says earlier about 30% of the total travel time was spent at border checkposts and due to congestion. Quoting an analysis of freight movement in top 15 states before July 1 (pre-GST period), the booklet says while in states such as Rajasthan and Maharashtra where only 20-30 minutes were spent at any border on an average, there were states such as Bihar and Jharkhand where commercial vehicles would end up spending over two hours at each border.